Shooting from a bench, under cover, in a light drizzle with a token 3 o'clock wind. I think I may have found the ammo this gun really likes. 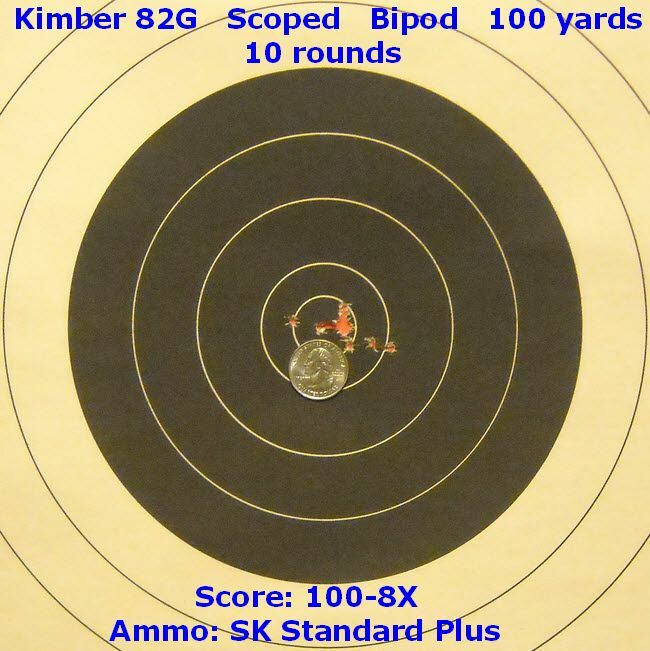 That one round almost-in-the-nine-ring resulted from adjusting the windage knob in the wrong direction (to the right instead of to the left), after shooting that ten at 4 o'clock, right next to it. DOH! Could have been another X maybe, except for operator error; ...the nut behind the buttplate? now thats some serious shooting!!!!!!! !.well done. to our little group. That is some good shooting. Kimber makes a fine gun. They are available from the CMP for less than $700 I believe (w aperture sights). Yes, I got this gun from the CMP for $400 w/aperture sights, including multiple inserts, then replaced them with this scope (but preserved the apertures for future use). The barrels are fully floated the length of the forestock, which includes an accessory rail underneath; handstop is also included. The $400-special guns supposedly exhibit rust (somewhere), but no one who has purchased one has ever found any rust of any significance. The speculation is what the CMP calls rust is actually the flaked remnants of dried and caked storage preservative. The non-rusty versions are $600. 99.99% of the rifles have a miniscule-to-larger razor scratch, typically in the buttstock or barrel or both. I defy you to find the scratch on mine. The cuts resulted from inept Army inventory specialists (probably a boot camp detail squad), who were tasked to open the boxes and wrappers to log the serial numbers, and were provided box cutters to help them in their duties. With that combo you can be competitive in smallbore prone. Now you need a shooting coat, glove and sling. If you go to the National Championships and finish in the top 10% for three years you will become Distinguished Smallbore Prone. Very few folks make it. There are thousands of highpower distinguished but only about 150 smallbore prone distinguished.